FFG's Runewars Miniatures Game still hasn't been released, but they did announce the first wave of expansion packs a couple of days ago. I'm really looking forward to this game. 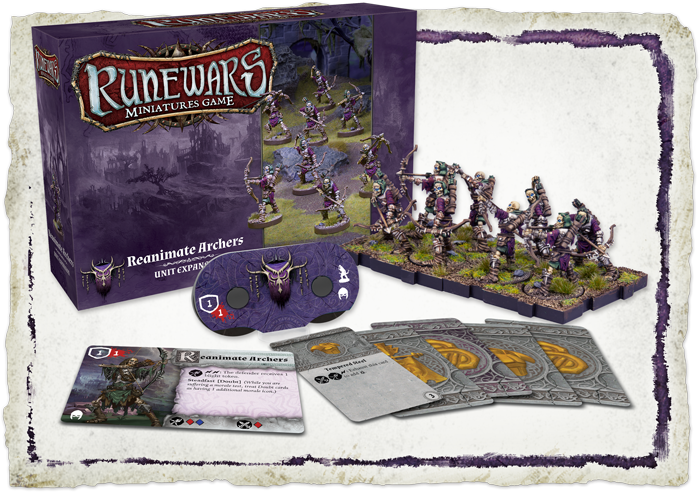 I think it'll fill the need for a fantasy rank and file game without the total clusterfeth that is Games Workshop's rule sets. The first wave will have packs for the Daqan Lords and Waiqar the Undying factions. Two other factions have been announced/leaked, but I don't think we'll see their models until wave 2 or 3. Each of these costs $24.95, which seems expensive on the surface, but on further review seems like a perfectly sound price point. From what I can tell, two core sets worth of each faction makes for a "standard" sized army. So, if my friend and I both buy a starter and then swap out the faction we don't want, we're getting a full army for $99.95. 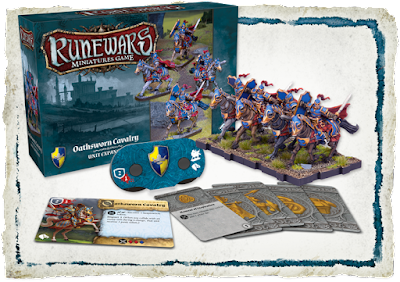 The extra $24.95 packs give us more options and let us customize our armies a bit. 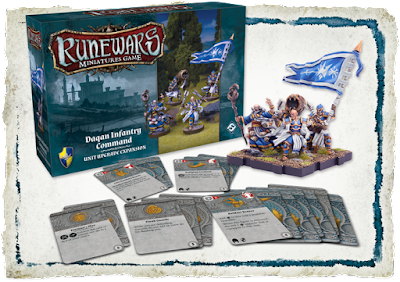 The Daqan Lords have a set of Oathsworn Cavalry and a Daqan Infantry Command box. Both boxes come with additional upgrade cards that aren't in the core set. In much the same way that it's worthwhile to buy a Victory-class Star Destroyer expansion box in Star Wars Armada, it'll probably be worthwhile to buy an Oathsworn Cavalry box despite already getting them in the core box. More on the upgrade cards in a bit. Waiqar the Undying gets a box of Reanimate Archers as well as a Waiqar Infantry Command box. Just like with the Daqan Lords, these boxes will come with upgrade cards that aren't in the core box. In both cases, the Infantry Command box models are designed to be added to other units. As you can see from the pictures, they don't come with their own command dial, but they DO come with a ton of upgrade cards. Speaking of the upgrade cards, FFG spoiled two of them, one from each faction. It's important to note that the two cards have the logos of the Daqan Lords and Waiqar the Undying factions. This means that they're not compatible between factions in the same way that Star Wars X-Wing cards can be used for Imperial, Rebel or Scum ships. 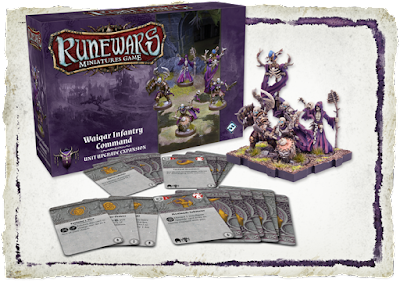 FFG has said that you'll never have to buy a Daqan Lords box to get cards for your Waiqar the Undying army. Time will tell. 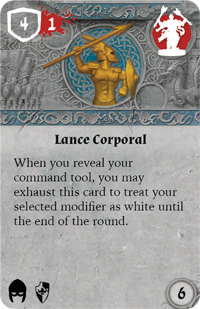 I'm really hopeful that if there are "neutral" cards that they just put them in every factions' products. The cards above give a taste of what we can expect from the upgrades. Presumably, the shield and "red splatter" number represent the defense and health of the model being upgraded. These are both from the Infantry Command boxes. I'm guessing that the one on the left is the Daqan Lords champion dude while the one on the right is pretty clearly a Reanimate skellington. I don't yet know what a "white modifier" is, but if it's anything like X-Wing, the color of a maneuver indicates whether a unit gains advantage or penalty by performing it. 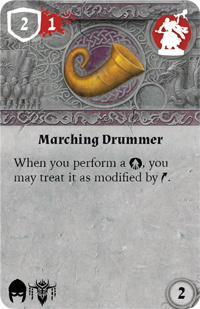 The Marching Drummer card is a little more straightforward. You get to bank left of right when marching, without picking the "bank" modifier. I can see a drummer being a must take for flexible maneuvering. I'm assuming that the little number in the bottom right is the points cost. Overall, I'm pretty excited. I was expecting a single base (4 models) of basic infantry to cost $19.99, so getting two full bases for $24.95 is a nice surprise. $24.95 for the four upgrade characters also seems reasonable as they're likely to act as force multipliers. I can't wait for this game to come out.